Rubber stamp inks for any purpose and application. 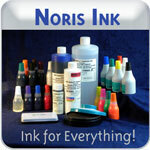 Noris, Shiny, Marsh, Secure Stamp, and Lion inks all in stock and ready to ship from Indiana Stamp. A Full Line of Inks -- in stock and ready to ship! We carry a broad range of inks to meet all your rubber stamping and marking needs. Whether you're stamping paper in your office, lot codes on parts, date codes on food packaging, or rubber stamping with your kids, we have you covered! Most inks are in-stock and ready to ship. Re-inking an office stamp pad? Not sure what ink is best for your needs? Feel free to contact our friendly representatives at 877-424-5395 or visit NorisUSA.com and click the "Find My Ink" option, fill out an Ink Inquiry Form or email us.